FONSECA, Erick R. ; et al. Tweaking Word Embeddings for FAQ Ranking In: EVALITA. 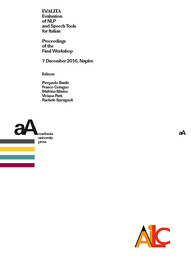 Evaluation of NLP and Speech Tools for Italian: Proceedings of the Final Workshop 7 December 2016, Naples [en línea]. Torino: Accademia University Press, 2016 (generado el 26 avril 2019). Disponible en Internet: <http://books.openedition.org/aaccademia/1981>. ISBN: 9788899982553. DOI: 10.4000/books.aaccademia.1981.